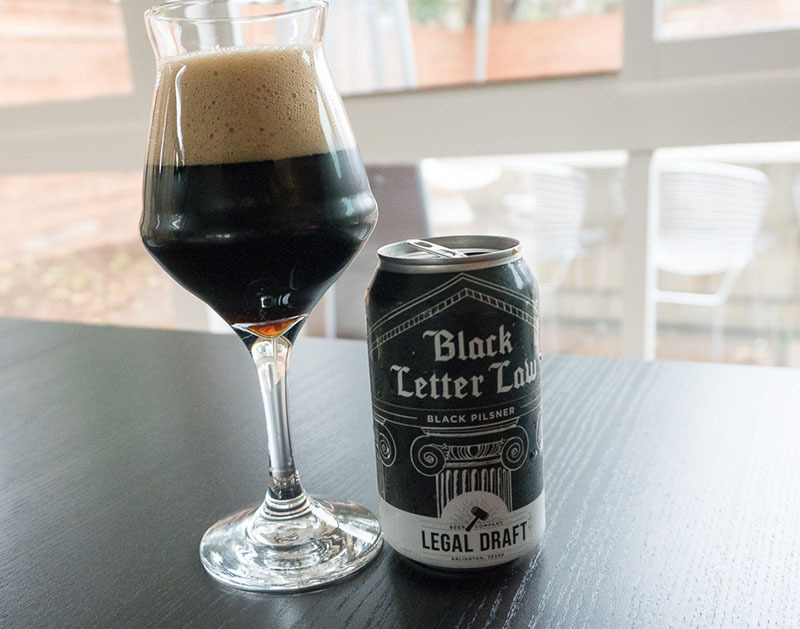 On Tap: Legal Draft Beer Company’s Black Letter Law. 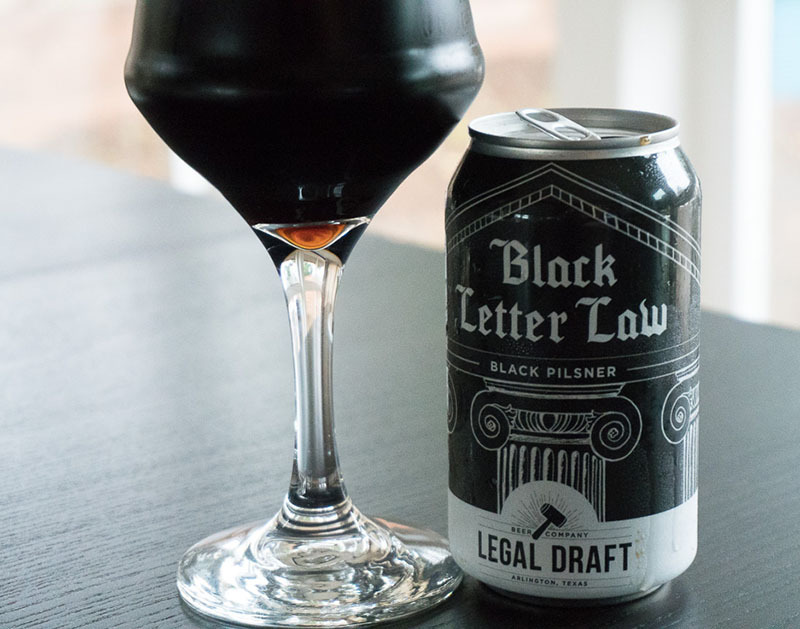 Legal Draft Beer Company’s Black Letter Law Is A Sessionable Black Beer With Hints Of Coffee And Chocolate In Both Its Aroma And Flavor. 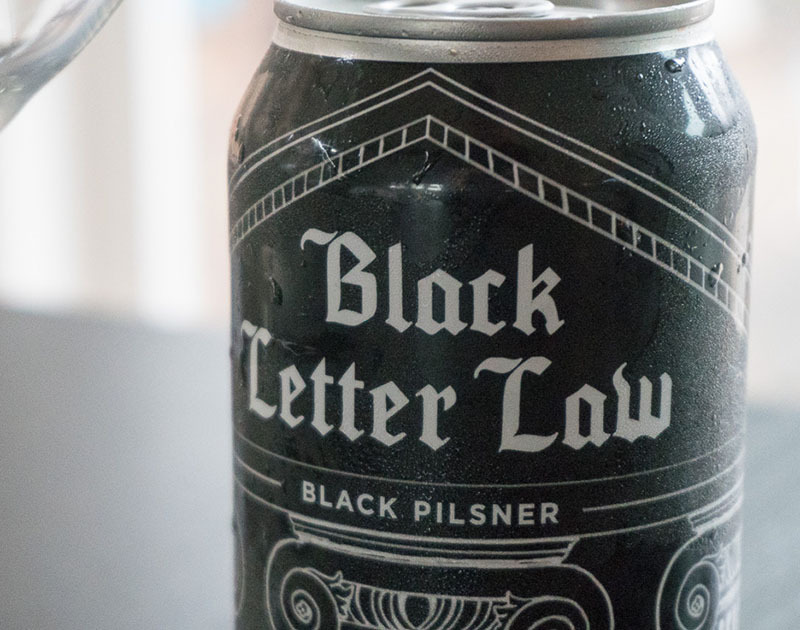 This week, we sipped on Legal Draft Beer Company’s Black Letter Law. Fast Facts on Legal Draft Black Letter Law. Hooray, hooray. After writing years of reviews, we finally break ground on a style rarely seen in the North Texas beer scene: the Schwarzbier. 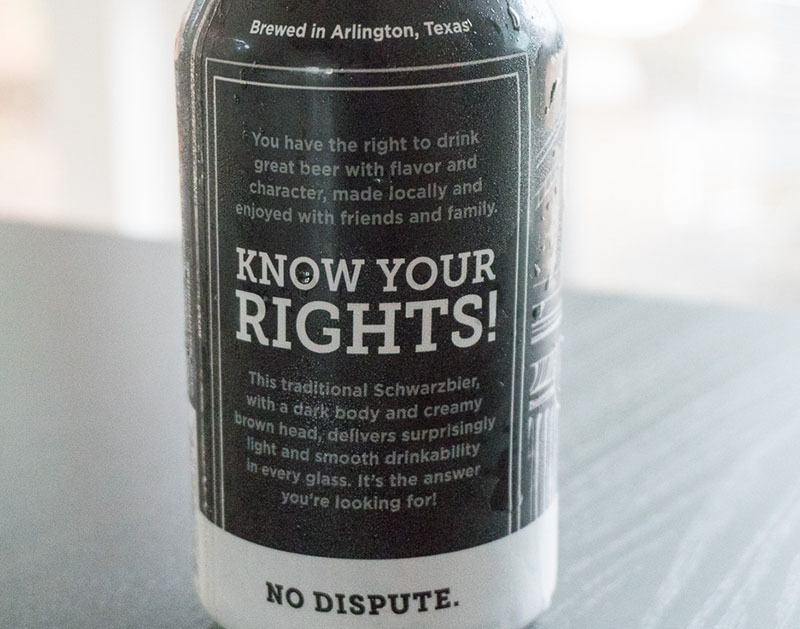 Arlington’s Legal Draft Beer Company brings on the black beer action in this week’s review. Legal Draft fully embraces the legalese and jargon through its entire lineup; I do not object to its judicious use of legal terms all the way through its branding experience. Because what’s life without an abundance of puns? It’s not often that we get to talk about the Schwarzbier style. 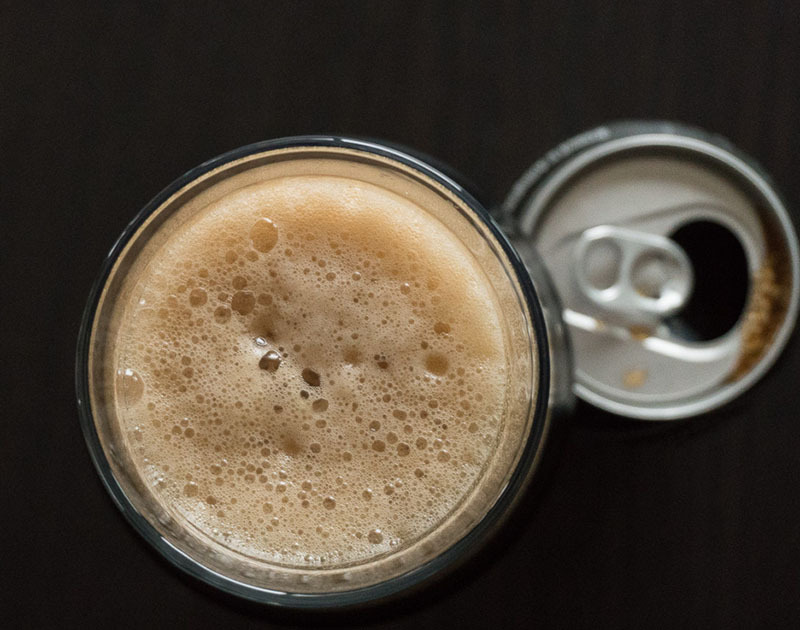 This type of brew is one of those that’s like a change-up pitch. Some of the traits you might consider that go with a few different styles are combined together in the Schwarzbier style for some interesting results. The Schwarzbier style comes to us from Germany, the motherland of beer. Translated to English, the word Schwarzbier means black beer. The deep color comes from a judicious use of darker, higher-kilned, husk-less malts. The idea here is to give the beer some roast flavors, but not burnt flavors. IBU ranges are typical to most pilsner style beers, and alcohol should stay in the 4-5 percent range. Like other pilsners, the Schwarzbier style should be fermented with a lager yeast. Body should be light-ish to medium, providing for a lighter-than-expected drinking experience. It should be noted that the Schwarzier style is not super-popular on either the global or local scale. Sure, you’ll find a few versions of the style available at a craft beer store, but don’t go thinking that this style holds the collective beer drinking population’s attention like, say, an IPA. If you want to a have a similar style beer made by a local brewery, check out Ugly Pug from Rahr & Sons Brewing Company. Black Letter Law pours very dark brown into the glass. I witness a generous amount of tan foam that hangs around for quite some time. After the initial head dissipates, a thin layer of foam loiters about and some of it clings to the sides of the glass as I sip. Clarity isn’t something to spend much time on with this beer, but from what I can see on the fringes of the glass, this beer looks clean and a tiny amount of light shines through it. I get a healthy amount of roast notes on Black Letter Law. There’s also a subtly sweet amount of chocolate on the nose here, too. Compared to another Euro-type pilsner, this style doesn’t exactly fit what I think of what I think pilsner. And that’s because that unmistakable pilsner character is hidden behind waves of roasted, round aromas. Black Letter Law tastes clean and bright. I get roast notes that start on the sip and linger through the aftertaste. There’s a small amount of bitterness here — likely from the use of traditional Noble hops added during the boil. Hop character, though, is not what this beer is about. Here with the roast notes come a tiny bit of chocolate and something like coffee. These dark malt flavors seem to run together, but the flavor doesn’t head over into what I would consider anything of the burnt character. This beer is a medium-bodied beer. I feel like the dark malts provide some nice complexity here. And perhaps the mash temperature was turned up a bit to help this beer remain in the session area, while at the same time give this beer a bit more body and a touch of residual sweetness. I can’t count the amount of Schwarzbiers I have purchased in the past year. That’s because I have no idea. It’s likely a small number, though, and I don’t have a good explanation for it. Maybe it’s because Schwarzbier – as a style – just isn’t that popular. Maybe it’s because this style is a bit tough to find here in North Texas. So, points to Legal Draft for introducing its customer base to an underrepresented style. I think Black Letter Law is deceptively drinkable. I’m most of the way through one beer and find myself reaching for a second pour. I like that this is a low ABV beer, too, and its full flavor tricks my brain into thinking that this is a boozier beer. All in all, this beer is a success. Black Letter Law, while perhaps not the most popular beer on Legal Draft’s menu, may be the best beer I have tried from this brewery so far. Score. On a scale of 1 to 10, I’d give Legal Draft Black Letter Law a 7. Previous ArticleThings To Do In Dallas On Thursday, February 22. Next ArticleGame Night Is Surprisingly Well Played.